Infections like strep throat, bronchitis, and pneumonia are common, especially in the cold months of the year. Getting a proper diagnosis and receiving effective treatment is the best way to stop these conditions from worsening or spreading to others. 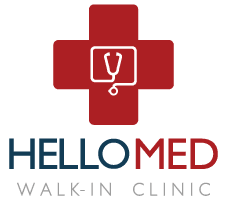 At HELLOMED in Ann Arbor, Michigan, the experienced physicians offer comprehensive care to help you recover from illness and get you back to your routine. Visit the clinic as a walk-in, or book an appointment online or by phone today. In some cases, a rash known as scarlet fever may also accompany strep throat. Strep throat is contagious and spread through contact with infected fluids produced by coughs and sneezes. Touching your mouth, nose, or eyes after coming into contact with contaminated fluids can make you sick. Sharing utensils or glassware with an infected person can also spread the infection. Bronchitis is a condition marked by the inflammation of the bronchial tubes that transport air to and from your lungs. With bronchitis, your body produces thick mucus in response to the inflammation. Pneumonia is an inflammatory infection of the lungs and viruses, bacteria, fungus, or other debris that irritates the lungs cause it. If you have pneumonia, your lung tissue swells, and you may find it difficult to breathe. How are strep throat, bronchitis, and pneumonia treated? The doctors at HELLOMED offer comprehensive and rapid testing to identify the problem. The team offers on-site strep testing to accurately diagnose a strep infection and treat it effectively with antibiotics. For bronchitis and pneumonia, your doctor performs a physical exam and discusses your symptoms. They listen to your lungs to assess your ability to breathe and may order imaging tests to take a closer look at your lungs. Your doctor may provide antibiotics for bacterial infections. If the condition is related to a virus, they may recommend other medications or treatments. To learn more about treatment options, schedule an appointment online or by phone, or visit the clinic as a walk-in.